The aim of this review is to provide a clear understanding of the actions of the micronized purified flavonoid fraction (MPFF) at various pathophysiological stages of chronic venous disease (CVD), the mechanisms that underlie its efficacy, and the evidence for clinical applications for symptom relief, reversal of skin changes, healing of leg ulcers, and improving quality of life (QOL), with perspectives from the 2018 international guidelines. MPFF relieves symptoms, edema, skin changes, and improves QOL. MPFF can be used alone in the early stages or as an adjunct to surgery, sclerotherapy, endovenous thermal ablation, or compression. 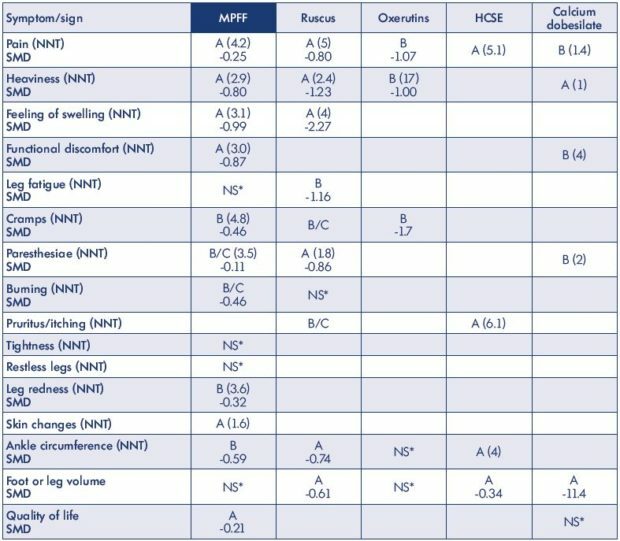 It can be used at all stages of the clinical, etiological, anatomical, and pathophysiological (CEAP) classification (C0s and C1–C6). MPFF is an alternative therapy when surgery is not feasible, not indicated, or when patients are unable to use compression. In the 2018 international guidelines, which determine the magnitude of the effect of individual venoactive drugs on individual symptoms, MPFF is strongly recommended for the treatment of pain, heaviness, feeling of swelling, functional discomfort, cramps, leg redness, skin changes, edema, and quality of life, as well as for the healing of leg ulcers in patients with CVD. Chronic venous disease (CVD) is a common, but complex, disorder. It presents with a variable combination of symptoms and signs, a complex pathophysiology, and it is associated with complicated venous hemodynamics, making it difficult to understand without being familiar with the theory of hemodynamics in collapsible tubes. In addition, it is a progressive condition. The symptoms1 and signs2 related to CVD are shown in Table I. 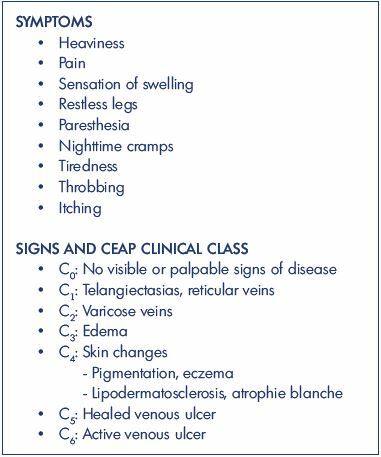 Symptoms describe what the patient feels and signs are elicited by the doctor and are typically used to define the clinical classes according to the clinical, etiological, anatomical, and pathophysiological (CEAP) classification. One of the diagnostic problems is that symptoms are not specific for CVD and there is a poor correlation between symptoms and signs. However, what the patient seeks is relief of symptoms, often more than improved appearance. What the doctor aims for is not only to relieve symptoms and improve appearance, but also to stop disease progression. Micronized purified flavonoid fraction (MPFF) is highly effective in relieving symptoms in patients with CVD. It contains purified flavonoids (90% diosmin with 10% hesperidin and other concomitant flavonoids) that have been extracted from Rutaceae aurantiae (a variety of small size oranges) and micronized to help improve intestinal absorption.3 It has multiple beneficial actions and it is effective at all stages of CVD. The postthrombotic syndrome is responsible for edema, skin changes, and 60% of venous ulcers; in addition, it is responsible for the development of secondary varicose veins that act as collateral vessels. Persistent obstruction due to failed recanalization and recurrence of deep venous thrombosis or reflux due to damage of the deep venous valves also results in venous hypertension. The combination of both reflux and obstruction of the deep veins is responsible for the most severe symptoms and signs. In cases of severe outflow obstruction, venous pressure while walking may increase to levels above 90 mm Hg. Spontaneous contractility of lymphatic vessels contributes to lymph transport. Internal extensions of lymphatic endothelial cells act as valves and guarantee a one-way lymph flow.15 In a steady state, extravasation of fluids and proteins from blood vessels is balanced by lymphatic drainage and return into the bloodstream. If microvascular filtration in blood capillaries and venules, as occurs in advanced CVD, exceeds the capacity for lymphatic drainage for sufficiently long periods, edema develops in afflicted areas due to the accumulation of tissue fluid. MPFF has anti-inflammatory, antioxidant, and powerful free-radical scavenging properties.3 MPFF decreases the expression of adhesion molecules by neutrophils and monocytes in patients with CVD. Given the above effects, it is not surprising that MPFF reduces capillary hyperpermeability. It reduces capillary leakage in the ischemia-reperfusion injury in the experimental animal26 and reduces edema in patients with CVD (see clinical studies below). In addition, the restoration of normal venous tone can make incompetent valves become competent and abolish early reflux as shown in the studies by Tsukanov.27,28 In the first study, he investigated 41 C0s women with duplex scanning in the morning (before 10 am) and in the afternoon (after 6 pm)27; 15 did not have any reflux at any time. The remaining 26 patients had reflux in the great saphenous vein (GSV) only in the evening (situational reflux); 2 patients had axial reflux and24 segmental reflux. The evening diameter of the GSV was larger in those with reflux (P<0.05). The difference in the GSV diameter between the evening and morning was also greater in the patients with evening reflux than in those without reflux. After 2 months of MPFF treatment, 22 patients no longer had reflux in the evening, the GSV diameter decreased, along with the difference in diameter between the morning and evening (P<0.0001). There was a parallel significant decrease in the intensity of symptoms as demonstrated by the visual analog scale score and a significant improvement in QOL (CIVIQ) (P<0.00001). In a subsequent study by Tsukanov,28 involving 294 patients, the prevalence of situational reflux in the GSV was investigated. It was detected in 21 (38.2%) of 55 patients classified as C0s, 25 (49.0%) of 51 classified as C1s, and in 32 (17.0%) of 188 classified as C2. After treatment with MPFF 1000 mg for 90 days, reflux disappeared in 76.1% of the 46 women with transient reflux in classes C0s and C1s, and there was a significant decrease in the GSV diameters. The intensity of symptoms decreased from 5.2 to 1.7 (P<0.001) according to the 10-cm visual analog scale. The global index score (CIVIQ-20) decreased from 47.2±7.9 to 28.8±9.1 (P<0.001), confirming the improvement in the patients’ quality of life. As stated in the 2018 international guidelines, these studies show that MPFF has at least the potential to prevent the development and progression of CVDs and its different manifestations. The Cochrane review of 200529 and other recent meta-analyses by Allaert,30 Boyle et al,31 and Kakkos et al32 demonstrated that looking at the effect of individual drugs on individual symptoms is feasible and can provide a meaningful measurement of the magnitude of the effect as well as the number of patients needed to treat to have benefit in one patient. As a result of the above, the faculty revising the guidelines on CVD in 20184 decided to scrutinize both old and new meta-analyses that provide data so as to allow the level of available evidence for the magnitude of the effect each venoactive drug has on each symptom to be determined. The rules of evidence are presented in Table II. What emerged as a result of this exercise, as summarized in Table III, was that convergent data confirmed the important role of venoactive drugs in the management of CVD, either alone in the early stages or in combination with interventional procedures in the more advanced stages. The recent systematic review and meta-analysis of randomized, double-blind, placebo-controlled trials for the efficacy of MPFF to improve individual venous symptoms by Kakkos and Nicolaides identified ten publications of randomized placebo-controlled studies involving 1692 patients.33 There was generally a minimal risk of bias in most of these trials. CEAP clinical class ranged between C0 to C6 with some studies allowing inclusion of patients with a postthrombotic syndrome. Table II. 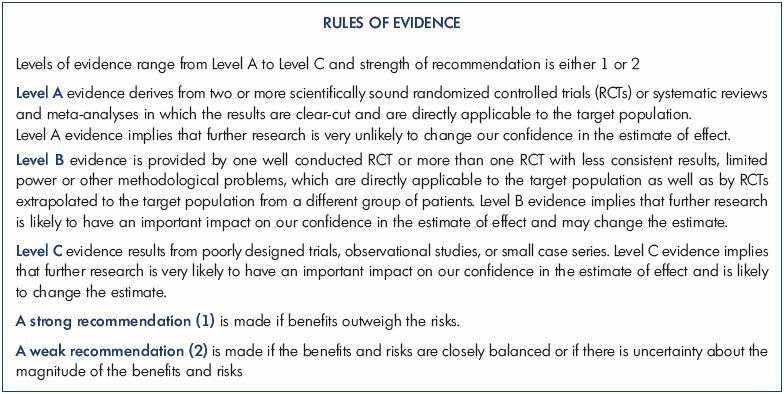 Rules of evidence as published in the 2018 international guidelines. From reference 4: Nicolaides A et al. Int Angiol. 2018;37(3):181-254. Pain was reduced with the use of MPFF compared with placebo when assessed as a continuous variable in three studies, each one significant, and involving 839 patients (standardized mean difference (SMD), -0.25; 95% CI, -0.38 to -0.11.34-36,39-40 It was also reduced when assessed as a categorical variable in three studies, involving 271 patients, two of which were significant.34,35,37 The risk ratio was 0.53 (95% CI, 0.38 to 0.73) and the NNT was 4.2 (95% CI, 2.8 to 7.9). The level of evidence was high (Grade A). Heaviness was reduced compared with placebo when assessed as a continuous variable in two studies, both significant and involving 254 patients (SMD, -0.80; 95% CI, -1.05 to -0.54).34,35 It was also reduced when assessed as a categorical variable in three studies involving 283 patients, two of which were significant. 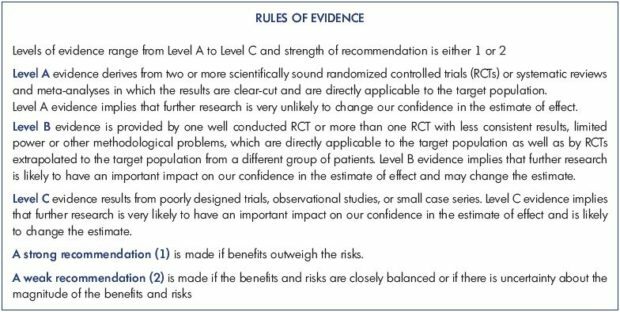 The risk ratio was 0.35 (95% CI, 0.24 to 0.51) and the NNT was 2.9 (95% CI, 2.2 to 4.2).33,35,38 The level of evidence was high (Grade A). The feeling of swelling was reduced compared with placebo when assessed as a continuous variable in two studies involving 254 patients, each one significant (SMD, -0.99; 95% CI, -1.25 to -0.73).34,35 The feeling of swelling was also reduced when assessed as a categorical variable in three studies involving 267 patients, two of which were significant.34,35,37 The risk ratio was 0.39 (95% CI, 0.27 to 0.56) and the NNT was 3.1 (95% CI, 2.3 to 4.8). The level of evidence was high (Grade A). Cramp severity was reduced compared with placebo when assessed as a continuous variable in one study involving 150 patients (SMD, -0.46; 95% CI, -0.78 to -0.14).34 A significant effect was also observed for cramp reduction compared with placebo when assessed as a categorical variable in two studies involving 119 patients, one of which was significant.35,37 The risk ratio was 0.51 (95% CI, 0.29 to 0.92) and the NNT was 4.8 (95% CI, 2.7 to 22.9). The level of evidence was moderate (Grade B). Paresthesia (tingling) was not reduced with the use of MPFF compared with placebo when assessed as a continuous variable of end of treatment values in one study involving 150 patients (SMD, -0.11; 95% CI, -0.44 to 0.21).34 However, a significant effect was observed compared with placebo when assessed as a categorical variable in another study involving 61 patients.35 The risk ratio was 0.45 (95% CI, 0.22 to 0.94) and the NNT was 3.5 (95% CI, 1.9 to 20). The level of evidence was moderate to low (Grade B/C). Burning sensation was reduced compared with placebo when assessed as a continuous variable in one study involving 150 patients (SMD, -0.46; 95% CI, -0.78 to -0.14).34 A significant effect was not observed when assessed as a categorical variable in two other studies involving 96 patients.35,38 The risk ratio was 0.67 (95% CI, 0.38 to 1.17). The level of evidence was moderate to low (Grade B/C). Functional discomfort was significantly reduced compared with placebo when assessed as a continuous variable in two studies involving 254 patients, both being significant (SMD, -0.87; 95% CI, -1.13 to -0.61).34,35 It was also significantly reduced in two studies involving 134 patients, both being significant.35,38 The risk ratio was 0.41 (95% CI, 0.25 to 0.67) and the NNT was 3.0 (95% CI, 2.1 to 5.8). The level of evidence was high (Grade A). Tightness,39 fatigue,40 and restless leg symptoms39 were nonsignificantly reduced with the use of MPFF compared with placebo. Leg redness was reduced compared with placebo when assessed as a continuous variable in two studies (one significant) involving 254 patients (SMD, -0.32; 95% CI, -0.56 to -0.07),34,35 and it was reduced in one study involving 66 patients when assessed as a categorical variable.35 The risk ratio was 0.50 (95% CI, 0.27 to 0.94) and the NNT was 3.6 (95% CI, 2.0 to 20.6). The level of evidence was moderate (Grade B). Skin changes were improved compared with placebo when assessed as a categorical variable in two studies involving 61 patients, both being significant.34,35 The risk ratio was 0.18 (95% CI, 0.07 to 0.46) and the NNT was 1.6 (95% CI, 1.2 to 2.2). The level of evidence was high (Grade A). Ankle circumference was reduced with the use of MPFF compared with placebo when assessed as a continuous variable in two studies involving 282 patients, one of them being significant (SMD, was -0.59; 95% CI, -1.15 to -0.02).35,39 The level of evidence was moderate to low (Grade B). Quality of life improved with the use of MPFF compared with placebo when assessed as a continuous variable in two studies, both significant and involving 601 patients. (SMD, -0.21; 95% CI, -0.37 to -0.04).36,40 The level of evidence was high (Grade A). A meta-analysis of five randomized controlled trials involving 723 patients with venous ulcers41 demonstrated that, at 6 months, ulcers healed faster when MPFF was combined with compression than with compression alone. Compression in addition to MPFF was compared with compression plus placebo in two of the studies (n=309) or with compression alone in three studies (n=414). At 6 months, the chance of ulcer healing was 32% higher in patients treated with the combined therapy than in those managed by compression alone (relative risk ratio [RRR], 32%; 95% CI, 3% to 70%), translating to a NNT of 7.3 (95% CI, 4.6 to 17.1). This difference was present from month 2 (RRR, 44%; 95% CI, 7% to 94%) and was associated with a shorter time to healing (16 weeks vs 21 weeks; P=0.0034). The level of evidence was high (Grade A). Table IV presents the level of evidence for the effects of the main medications on leg ulcer healing. 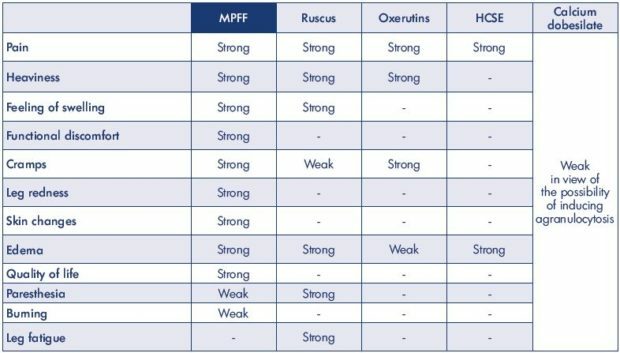 Based on the 2018 findings (magnitude of effects on individual symptoms or signs vs side effects), the strength of recommendations for MPFF is 1 (strong) for the treatment of pain, heaviness, feeling of swelling, functional discomfort, cramps, leg redness, skin changes, edema, and quality of life, and it is 2 (weak) for paresthesia and burning (Table V). Nicolaides A et al. Int Angiol. 2018;37(3):181-254.
venoactive drugs as published in the 2018 international guidelines. Adapted from reference 4: Nicolaides A et al. Int Angiol. Chronic venous disease is a complex condition characterized by chronic inflammation and remodeling of the venous wall, resulting in valve damage, reflux, and venous hypertension. Chronic inflammation eventually affects the microcirculation, producing skin changes and ulceration. MPFF has a unique combination of actions: anti-inflammatory, antioxidant, and powerful free-radical scavenging properties. It decreases the expression of adhesion molecules on neutrophils and monocytes in patients with CVD, providing particularly protective effects in the venous walls and valves. In addition, it improves venous tone and increases lymphatic drainage. The studies show that MPFF at least has the potential to prevent the development and progression of CVD and its different manifestations. Given the above actions, it is not surprising to see the remarkable clinical results. MPFF relieves symptoms, reduces edema, and skin changes, as well as helps in leg ulcer healing. In addition, MPFF improves quality of life, a property not shown by any other venoactive drug. MPFF can be used alone in the early stages or as an adjunct to surgery, sclerotherapy, endovenous thermal ablation, or compression. It can be used at all stages of CEAP (C0s and C1-C6). MPFF is an alternative therapy when surgery is not feasible, not indicated, or when patients are unable to use compression. The low NNT suggests cost effectiveness, while requiring confirmation from further prospective randomized controlled trials. In the 2018 international guidelines, which determine the magnitude of the effect of individual venoactive drugs on individual symptoms, MPFF is strongly recommended for the treatment of pain, heaviness, feeling of swelling, functional discomfort, cramps, leg redness, skin changes, edema, and quality of life, as well as for the healing of leg ulcers in patients with CVD. 1. Perrin M, Eklof B, van Rij A, et al. Venous symptoms: the SYM Vein Consensus statement developed under the auspices of the European Venous Forum. Int Angiol. 2016;35(4):374-398. 2. Eklof B, Rutherford RB, Bergan JJ, et al. Revision of CEAP classification for chronic venous disorders: consensus statement. J Vasc Surg. 2004;40(6):1248-1252. 3. Katsenis K. Micronized purified flavonoid fraction (MPFF): a review of its pharmacological effects, therapeutic efficacy and benefits in the management of chronic venous insufficiency. Curr Vasc Pharmacol. 2005;3(1):1-9. 4. Nicolaides A, Kakkos S, Baekgaard N, et al. Management of chronic venous disorders of the lower limbs. Guidelines according to scientific evidence. Part I. Int Angiol. 2018;37(3):181-254. 5. Carradice D, Mazari FA, Samuel N, Allgar V, Hatfield J, Chetter IC. Modelling the effect of venous disease on quality of life. Br J Surg. 2001;98(8):1089-1098. 6. Bergan JJ, Schmid-Schönbein GW, Smith PD, Nicolaides AN, Boisseau MR, Eklof B. Chronic venous disease. N Engl J Med. 2006;355(5):488-498. 7. Mansilha A, Sousa J. Pathophysiological mechanisms of chronic venous disease and implications for venoactive drug therapy. Int J Mol Sci. 2018;19(6): pii: E1669. 8. Nicolaides AN. Investigation of chronic venous insufficiency: a consensus statement. Circulation. 2000;102(20):E126-E163. 9. Perrin M, Ramelet AA. Pharmacological treatment of primary chronic venous disease: rationale, results and unanswered questions. Eur J Vasc Endovasc Surg. 2011;41(1):117-125. 10. Leu AJ, Leu HJ, Franzeck UK, Bollinger A. Microvascular changes in chronic venous insufficiency–a review. Cardiovasc Surg. 1995;3(3):237-245. 11. Fagrell B. Microcirculatory disturbances – the final cause for venous leg ulcers? Vasa. 1982;11(2):101-103. 12. Belcaro G, Grigg M, Rulo A, Nicolaides A. Blood flow in the perimalleolar skin in relation to posture in patients with venous hypertension. Ann Vasc Surg. 1989;3(1):5-7. 13. Virgini-Magalhaes CE, Porto CL, Fernandes FF, Dorigo DM, Bottino DA, Bouskela E. Use of microcirculatory parameters to evaluate chronic venous insufficiency. J Vasc Surg. 2006;43(5):1037-1044. 14. Barros BS. Is there a link between symptoms and microcirculatory alterations? Presentation at EVF meeting, Athens, Greece 28-30 June 2018. 15. Rovenska E, Rovensky J. Lymphatic vessels: structure and function. Isr Med Assoc J. 2011;13(12):762-768. 16. Vital A, Carles D, Serise JM, Boisseau MR. Evidence for unmyelinated C fibres and inflammatory cells in human varicose saphenous vein. Int J Angiol. 2010;19(2):e73-e77. 17. Boisseau MR. Leukocyte involvement in the signs and symptoms of chronic venous disease. Perspectives for therapy. Clin Hemorheol Microcirc. 2007;37(3):277-290. 18. Pietrzycka A, Kózka M, Urbanek T, Stpniewski M, Kucharzewski M. Effect of micronized purified flavonoid fraction therapy on endothelin-1 and TNF-α levels in relation to antioxidant enzyme balance in the peripheral blood of women with varicose veins. Curr Vasc Pharmacol. 2015;13(6):801-808. 19. Katsenis K. Micronised purified flavonoid fraction (MPFF): a review of its pharmacological effects, therapeutic efficacy and benefits in the management of chronic venous insufficiency. Curr Vasc Pharmacol. 2005;3:1-9. 20. Pascarella L. Daflon and the protection of venous valves. Phlebolymphology. 2016;23:20-30. 21. Savineau JP, Marthan R. Diosmininduced increase in sensitivity to Ca2+ of the smooth muscle contractile apparatus in the rat isolated femoral vein. Br J Pharmacol. 1994;111(4):978-980. 22. Barbe R, Amiel M. Pharmacodynamic properties and therapeutic efficacy of Daflon 500 mg. Phlebology. 1992;7:41- 44. 23. Ibegbuna V, Nicolaides AN, Sowade O, Leon M, Geroulakos G. Venous elasticity after treatment with Daflon 500 mg. Angiology. 1997;48(1):45-49. 24. Cotonat A, Cotonat J. Lymphagogue and pulsatile activities of Daflon 500 mg on canine thoracic lymph duct. Int Angiol. 1989;8(suppl 4):15-18. 25. Mc Hale NG, Hollywood MA. Control of lymphatic pumping: interest of Daflon 500 mg. Phlebology. 1994;9(suppl 1):23-25. 26. Bouskela E, Donyo KA. Effects of oral administration of purified micronized flavonoid fraction on increased microvascular permeability induced by various agents and on ischemia/ reperfusion in diabetic hamsters. Int J Microcirc Clin Exp. 1995;15(6):293-300. 27. Tsukanov YT, Tsukanov AY, Nikolaychuk A. Great saphenous vein transitory reflux in patients with symptoms related to chronic venous disorders, but without visible sins (C0s), and its correction with MPFF treatment. Phlebolymphology. 2015;22:18-24. 28. Tsukanov YT, Tsukanov AY. Diagnosis and treatment of situational great saphenous vein reflux in daily medical practice. Phlebolymphology. 2017;24(3):144-151. 29. Martinez MJ, Bonfill X, Moreno RM, Vargas E, Capella D. Phlebotonics for venous insufficiency. Cochrane Database Syst Rev. 2005(3):CD003229. 30. Allaert FA. Meta-analysis of the impact of the principal venoactive drugs agents on malleolar venous edema. Int Angiol. 2012;31(4):310-315. 31. Boyle P, Diehm C, Robertson C. Metaanalysis of clinical trials of Cyclo 3 Fort in the treatment of chronic venous insufficiency. Int Angiol. 2003;22(3):250- 262. 32. Kakkos SK, Allaert FA. Efficacy of Ruscus extract, HMC and vitamin C, constituents of Cyclo 3 fort_, on improving individual venous symptoms and edema: a systematic review and meta-analysis of randomized doubleblind placebo-controlled trials. Int Angiol. 2017;36(2):93-106. 33. Kakkos S, Nicolaides AN. Efficacy of micronized purified flavonoid fraction (Daflon_) on improving individual symptoms, signs and quality of life in patients with chronic venous disease: a systematic review and metaanalysis of randomized double-blind placebo-controlled trials. Int Angiol. 2018;37(2):143-154. 34. Frileux C, Gilly R. Activité thérapeutique de Daflon 500 mg dans l’insuffisance veineuse chronique des membres inférieurs. J Int Med. 1987;99(suppl):36-39. 35. Planchon B. Insuffisance veineuse et Daflon 500 mg. Arteres Veines. 1990;9(4):376-380. 36. Rabe E, Agus GB, Roztocil K. Analysis of the effects of micronized purified flavonoid fraction versus placebo on symptoms and quality of life in patients suffering from chronic venous disease: from a prospective randomized trial. Int Angiol. 2015;34(5):428-436. 37. Biland L, Blattler P, Scheibler P, Studer S, Widmer LK. Zur Therapie sogenannt venoser Beinbeschwerden. (Kontrollierte Doppelblind-Studie zur Untersuchung der therapeutischen Wirksamkeit von Daflon). Vasa. 1982;11(1):53-58. 38. Chassignolle JF, Amiel M, Lanfranchi G, Barbe R. Activité thérapeutique de Daflon 500 mg dans l’insuffisance veineuse fonctionnelle. J Int Med. 1987;99(suppl):32-35. 39. Tsouderos Y. Are the phlebotonic properties shown in clinical pharmacology predictive of a therapeutic benefit in chronic venous insufficiency? Our experience with Daflon 500 mg. Int Angiol. 1989;8(suppl 4):53-59. 40. Belczak SQ, Sincos IR, Campos W, Beserra J, Nering G, Aun R. Venoactive drugs for chronic venous disease: A randomized, double-blind, placebo-controlled parallel-design trial. Phlebology. 2014;29(7):454-460. 41. Coleridge-Smith P, Lok C, Ramelet AA. Venous leg ulcer: a meta-analysis of adjunctive therapy with micronized purified flavonoid fraction. Eur J Vasc Endovasc Surg. 2005;30(2):198-208. 42. Meyer O. Safety of use of Daflon 500 mg confirmed by acquired experience and new research. Phlebology. 1992;7(suppl 2):64-68. 43. Guillot B, Guilhou JJ, de Champvallins M, et al. A long-term treatment with a venotonic drug: results on efficacy and safety of Daflon 500 mg in chronic venous insufficiency. Int Angiol. 1989;8(suppl 4):67-71.